Situated in the north-east corner of the Northern Territory, Kakadu and Arnhem Land combined claim one of the world’s most bio-diverse environments. The stone country, savannah woodlands, billabongs, floodplains, monsoon forests, tidal flats and coastal environments provide habitats for thousands of species of native flora and fauna. With over one third of Australia’s bird species, in excess of one thousand insect species and an abundant population of the world’s largest reptile (saltwater crocodile), this part of Australia is remote, wild and most of all intriguing. In saying all of this, the big question is: how do we, as members of the public get the opportunity to experience what’s out there? Can we see some of the rare endangered animals and what are the best areas to visit at what times of the year? Various areas of Kakadu National Park (20,000 km2) can be accessed via two major highways and to enter, all you need is a park pass which you can purchase at the borders of Kakadu. Entering Arnhem Land (100,000 km2) can be a little more difficult as entry is strictly by permit only. Depending on where you wish to travel, permits can be obtained in advance from the local land councils. Alternatively there are a number of small group tour options operating safaris into many restricted areas inaccessible to independent travellers. Click here for all your touring options. For the first time traveller to Kakadu National Park and Arnhem Land, here is a list of areas which provide great wild life, landscape, wild flower and photography opportunities. Birds in abundance and in great variety. 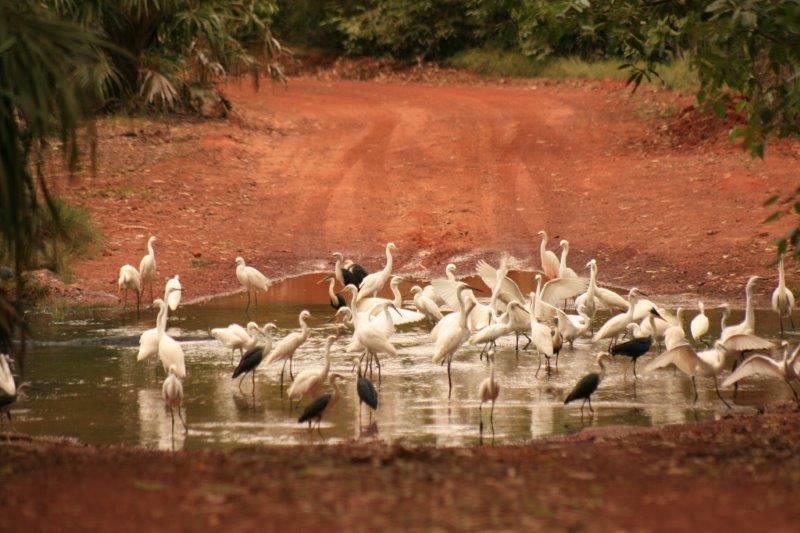 For birding tours from Darwin the best time of the year to visit is in the dry season, May-October. As an introduction to the superb colours, calls and species of Top End birds make sure to get out on a boat cruise in one of the many freshwater billabongs the Northern Territory is famous for. Corroboree Billabong (approx 100km east of Darwin) and Yellow Water Billabong (central Kakadu National Park) are a couple of your best destinations to get up and close with many of the Top Ends most iconic birds. Crocodiles in their natural environment. Australia has two species of crocodile, the freshwater crocodile (Corcodylus johnsoni) and the saltwater crocodile (Crocodylus porosus). In general most people come to the Top End to see the salt water crocodile, as they are the largest and most dangerous reptile on earth. They also happen to be much more abundant than their smaller relatives. Saltwater Crocodiles can be found in both fresh and saltwater with freshwater rivers and billabongs being home to the highest percentage. There are numerous boat cruises available such as Guluyambi cruise on the East Alligator River and Mary River cruises departing Mary River Wilderness Lodge. Locals tip: Head down to Cahills Crossing (the border of Arnhem Land and Kakadu) at high tide. The tides can be found online. There is a viewing platform where you can observe this tidal river as the crocodiles travel to the crossing to feed on mullet as the tide recedes. Warning: Do not cross Cahills Crossing unless safe to do so, currents can be deceivingly strong (permit required when entering Arnhem Land). To see freshwater crocodiles, jump on the Corroboree Wetlands Cruise in the dry season. Mammals that often go under the radar. Although there are over sixty species of mammal in Arnhem Land and Kakadu, they're not necessarily easy to find due to their nocturnal habits and shy nature. For the best chance to view these animals, either search for them early morning and late evening otherwise head out spotlighting at night. Driving to Injalak Hill in Arnhem Land (no entry without permit) early in the morning will give you the chance to view Agile Wallabies (Macropus agilis). A walk up Injalak Hill with a local Aboriginal guide will give you an opportunity to see some of Australia’s rare and endemic mammals such as the Black Wallaroo (Macropus bernardus) and the Short Eared Rock Wallaby (Petrogale brachyotis). Cobourg Coastal Camp is an ideal location to sight many of the Top Ends small nocturnal marsupials such as the Brush Tail Rabbit Rat (Conilurus penicillatus), Northern Sugar Glider (Petaurus breviceps ariel) and the Northern Bandicoot (Isoodon macrourus). Spotlighting tours are available on request. Marine animals and marine parks. In the far northern tip of the Northern Territory lies the NT’s largest marine park; Garig Gunak Barlu National Park, Arnhem Land. Home to six of the seven species of marine turtle, abundant dugong populations and world class fishing, this place is one of our countries most pristine and protected marine environments. Cobourg Fishing Safaris and Venture North offer a range of boat cruises taking you to the marine life hotspots in Port Essington as well as guiding tours through the historic Victoria Settlement. With a bit of luck you may even be lucky enough to spot a banteng (Bos javanicus), the last wild herd in the world. For more information on any of the above please contact Venture North directly.